RALEIGH, N.C. — The NCAA's decision to pull seven championships out of North Carolina ratchets up the pressure on this college sports-crazy state to repeal its law on bathroom use by transgender people. Unlike the recent one-time cancellations by the NBA and various rock stars, the move by college sports' governing body could make moderate and conservative voters question whether the price tag for the law has finally become too high. Economic development officials said the effect of the NCAA's action goes well beyond the projected $20 million in lost revenue from the cancellation of the 2016-17 basketball, baseball, soccer, tennis, lacrosse and golf events. "College sports is part of the fabric of North Carolina. It's part of the culture. I can say with confidence that there's no other state in the country that loves its college sports more than North Carolina. That's why it hits so hard and feels so personal," said Scott Dupree, executive director of the Greater Raleigh Sports Alliance, which was coordinating four of the events being moved. The law passed in March requires transgender people to use restrooms in schools and state government buildings that correspond to the gender on their birth certificate. It also excludes gender identity and sexual orientation from statewide antidiscrimination protections. The Obama administration is suing the state over the measure, calling it discriminatory. Republican Gov. Pat McCrory and GOP leaders are defending it as a means of protecting the privacy and safety of women and girls. On Tuesday, Democratic lawmakers urged McCrory and leaders of the GOP-controlled legislature to call a special session to repeal the law. "This General Assembly and its extremist leadership are playing with people's livelihoods and the well-being of communities all across our state," said Sen. Mike Woodard of Durham. But with weeks to go before Election Day, legislators in campaign mode and no regularly scheduled session until January, chances are slim the Republicans will act. GOP legislative leaders, who have veto-proof majorities in both chambers, are committed to costly court fights over the law and contend passing it was the right thing to do. GOP House Speaker Tim Moore didn't respond to messages seeking comment, and the office of Republican Senate leader Phil Berger said he was traveling and unavailable. McCrory, who is locked in a tight race for re-election, issued a statement decrying the NCAA decision and saying the legal system will ultimately decide the issue. "The issue of redefining gender and basic norms of privacy will be resolved in the near future in the United States court system for not only North Carolina, but the entire nation," he said. But in the meantime, Michael Bitzer, a political scientist at Catawba College, said it will be hard for moderate voters who are passionate about sports to ignore the law's repercussions. "The blowback may be building up even more with this decision," he said. Mac McCorkle, a Duke University professor and former Democratic consultant, said the NCAA's announcement reinforces the idea that McCrory has allowed the situation to get out of control. "Put aside the liberal and conservative arguments about the pros and cons," McCorkle said. "It's a mess. It's a continuing mess and governors are held responsible for messes." McCorkle said the removal of men's basketball tournament games from Greensboro hits hard because college basketball is the "civic religion" in the state that's home to UNC, Duke, N.C. State and Wake Forest. The Greensboro area was expected to receive a $14.5 million infusion from the tournament, as well as $1.6 million from the soccer championships in December that are being moved, said Henri Fourrier, CEO of the Greensboro Area Convention & Visitors Bureau. The soccer, baseball, lacrosse and tennis events taken from Cary will deprive the area of about $2 million, Dupree said. Greensboro, Cary, Raleigh and other North Carolina cities are seeking to host scores of other NCAA events over the next six years that could be worth tens of millions of dollars. The NCAA hasn't decided what to do about any North Carolina events beyond the current academic year. 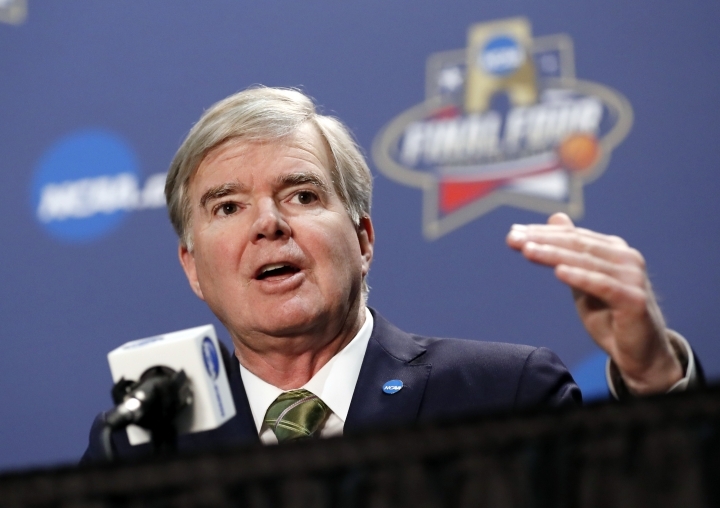 But NCAA President Mark Emmert said Tuesday: "It would have been impossible to conduct championship events in the state with that law in place that lived up to the values and expectations of the member universities and colleges." The Atlantic Coast Conference, which has its football championship scheduled for December in Charlotte, could be next to act. The championship game, held in Charlotte since 2010, is the last marquee college sporting event left in North Carolina during the 2016-17 season. The conference has a regularly scheduled meeting this week in South Carolina, and ACC Commissioner John Swofford said the bathroom law is on the agenda. Lt. Gov. Dan Forest, a Christian conservative and strong defender of the law, called the NCAA's decision "shameful extortion." Previously, musicians including Bruce Springsteen and Pearl Jam canceled concerts, while the NBA decided to move next year's All-Star Game out of Charlotte. The game was expected to generate $100 million. "Everybody should be concerned about lost revenue, but I don't put a price tag on our women and girls of any kind," Forest said. He added: "It's just unbelievable to me to think that these entities would think that it's OK to invade the privacy or security of a woman or a girl in a shower or a locker room." Brandon Smith, who works in risk management for a Charlotte-based bank, said he was against the law when it passed. "Once the financial aspect is taken into account, the state will change its stance," he said. "It's a matter of time." Contributing to this report were Associated Press writers Ralph D. Russo in New York; Aaron Beard in Hillsborough; Joedy McCreary in Raleigh; and Tom Foreman Jr. in Charlotte.